Late in the summer of 1877, a flock of purple-and-white hoopoes suddenly appears over the town of Constanta on the Black Sea, and Eleonora Cohen is ushered into the world by a mysterious pair of Tartar midwives who arrive just minutes before her birth. “They had read the signs, they said: a sea of horses, a conference of birds, the North Star in alignment with the moon. It was a prophecy that their last king had given on his deathwatch.” But joy is mixed with tragedy, for Eleonora’s mother dies soon after the birth. Raised by her doting father, Yakob, a carpet merchant, and her stern, resentful stepmother, Ruxandra, Eleonora spends her early years daydreaming and doing housework—until the moment she teaches herself to read, and her father recognizes that she is an extraordinarily gifted child, a prodigy. For me, The Oracle of Stamboul by Michael David Lukas had so much promise, and just did not deliver it. The magical quality with which the story began, the flock of purple and white hoopoes, the mysterious midwives who suddenly arrive lead one to believe that the book will continue in this way, but it does not. For the first bit of the book it does, but once Elenora’s father dies, Elanora becomes really a very bland character with no real personality. The book also takes on a much more passive quality to it, where in things happen TO Elenora, rather than her actively participating in things. It’s really too bad that the author, who had such a delightful premise going, apparently did not know how to bring it to fruition. Over at Goodreads, you’ll find some reviewers felt much the same way. On a star rating, I’d have to give this only a ***. It truly was only average. I’ll admit, my star rating would lean more toward 2 1/2 stars than a three if it were possible to do a 1/2 star review anywhere. 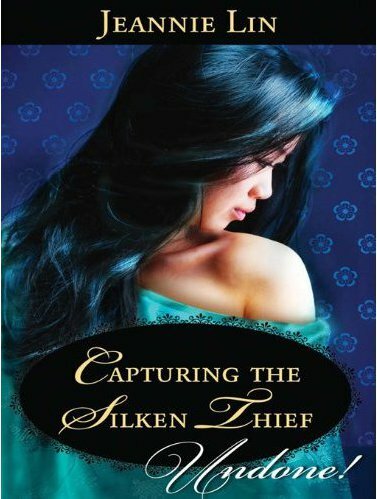 Capturing a Silken Thief by Jeannie Lin was a quick, fun read. Set in Changan during the Tang Dynasty in China 823 A.D, we follow the heroine, Yang Jia-jing, and the hero, Luo Cheng through about 56 pages of a richly detailed novella. Jia is a young song girl who plays the Pipa while Luo Cheng is a farmer boy who has studied for the Imperial Exams, which he has already failed once. If he fails again, he will be forced to return home in shame. Jia mistakes Cheng for a scholar in possession of a rare treasured book. Eventually, the end up searching for the book together. It’s a brief romp through Changan, but full of fun and adventure. More happens, but you’ll have to read Capturing the Silken Thief for yourself to find out what, and how the story ends. I enjoyed reading this short novella immensely, and it was my first time reading Jeannie Lin. I’ll be reading more of her books for sure. (Come back next week to find out what I thought of Jeannie Lin’s book, “butterfly Swords”. On a Star rating, this is a **** for sure. Leaning toward 4.25 stars. I do suggest this if you want a quick read and haven’t read Ms. Lin before. Have you read either of these books, and if so, what did you think of them? If you have not read either of them, are you interested in one or both of them? Comment below and let us know what YOU think. Disclaimer: I received both books in exchange for an honest review. Previous Previous post: Coming soon to an e-book publisher near you.